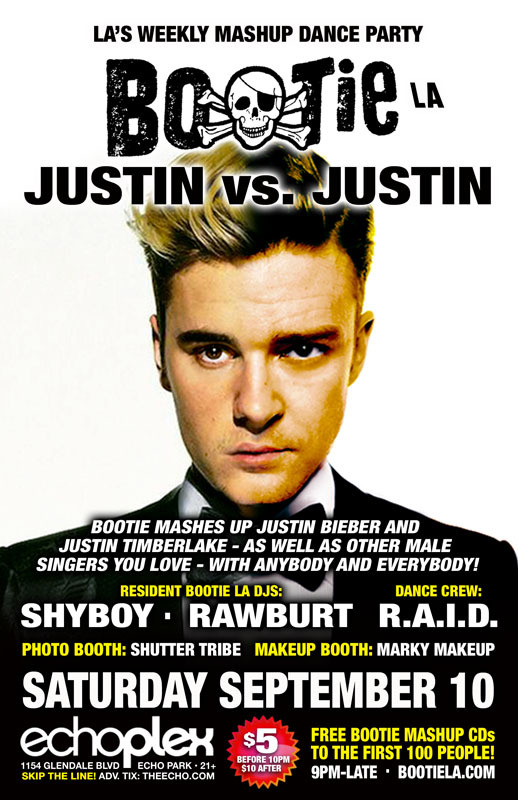 Bootie LA celebrates the boys of pop – it’s Justin vs. Justin Mashup Night! Timberlake and Bieber -- and many other male heartthrobs -- will get mixed and mashed with anybody and everybody all night long – including each other! No genre or era is safe! Only $5 before 10 PM! Bootie is out to make you a belieber all over again, as we pit two of the biggest men in pop against each other – It’s Justin vs. Justin Mashup Night! Tonight, we celebrate the boys of pop, as Bootie LA’s ShyBoy and Rawburt mix and mash the two Justin’s — and many other male heartthrobs — with anybody and everybody, keeping your booties bumping on the dance floor all night long! Resident dance crew R.A.I.D. (Random Acts of Irreverent Dance) presents a pop-deluxe Midnight Mashup Show, plus takes over the stage with their usual go-go madness, while Marky Makeup gives your faces and bodies a divalicious makeover, and Shutter Tribe captures all the fun! All this, plus FREE Bootie mashup CDs for the first 100 people through the door!